"The Rev. David Beauregard, a Roman Catholic priest who teaches Shakespeare at the seminary of St. Clement Eucharistic Shrine in the Back Bay, argues in his new book, 'Catholic Theology in Shakespeare's Plays' (University of Delaware Press), that Shakespeare was Catholic." Another book arguing that Shakespeare’s plays were written from a Catholic perspective. It’s too bad, but until there’s hard evidence that Shakespeare was a practicing Catholic, the literary establishment will keep ignoring these books. The best one so far is Claire Asquith’s Shadowplay. 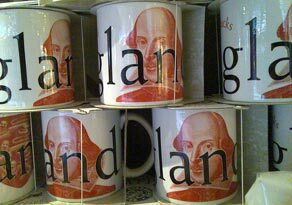 It’s too bad, but I don’t think more interpretations by literary experts about the hidden Catholic meaning in Shakeespeare’s work is going to sway the experts, who are hopelessly biased. It’s going to take objective proof that Shakespeare was Catholic: the discovery of his diary, or something like that.